The English Shepherd has been there to help us carve out our history in this country. Along side as the Farm collie, Farm Shepherd, Scotch Collie, Old time Collie-whatever name you want to call them-they were the most popular breed(s) of dog in the United States during the 1800 and early 1900's. Practically every family, whether farm, country or city had a relationship with these beloved dogs. We raise the Heritage Breed English Shepherd that were popular back in my Great Grandfathers day. The breed almost disappeared along with the small family farms that used to be an intricate part of everyday life. Growing up, our Farm Shepherds were constant companions, guardians of the Farm and babysitters of children. My favorite sitter was "Ole Mike" who I loved dearly. Grandpa said he was the best dog there ever was and I am sure Grandpa had known many dogs during his lifetime. Ole Mike and I would travel hill and dale together discovering wild strawberries, rabbit burrows or a fox den down by the creek. I was always under his watchful eye and I am sure he saved my hide many times. Our favorite rest spot was under the huge floribunda rose, an impenetrable fortress of thorns that provided shade and protection on hot summer days. It was Ole Mike's place but he let me hang out with him under the sweetly scented canopy. As the smaller, diversified, family farms dwindled in numbers, the English Shepherd faded from the land. And as the new "specialized" collie breeds gained popularity these dogs became rare indeed. At Sycamore Spring Farm we are passionate about preserving what we consider a national treasure-the English Shepherd- a true American Working Farm Collie. Our dogs are bred for excellent health, superior intelligence and a deeply ingrained desire to please their master. English Shepherds are intelligent, alert, responsive working dogs. They are exceptionally devoted, and sensitive and have a strong desire to work in partnership with their owner, whatever the task. English Shepherds have a strong herding instinct with exceptional agility, stamina, and stout-hearted perseverance. The breed has been long valued for their tracking, hunting and treeing abilities in addition to Herding and Guarding. Their unique blend of intelligence, athleticism, and train-ability, allows them to excel at many of the newer dog sports at the highest levels of obedience and agility. They also make outstanding partners in Search and Rescue, and many English Shepherds are certified Therapy Dogs. 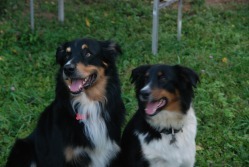 Thinking about an English Shepherd or Heritage Breed Collie? Moms & barnyards make great teachers. All our pups are farm born and raised. We have a socialization plan that will expose the pups to stock, poultry and lots of different people situations. A well bred and socialized pup is very people friendly and a joy to be around. They bond and respond quickly when treated respectfully and trained with fairness, firmness and fun. ​All of this early positive imprinting will prove POSITIVELY BENEFICIAL in your adult dog. 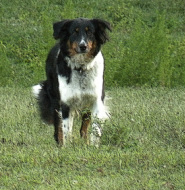 A healthy, happy, well bred English Shepherd, farm collie is very "tuned in" and empathetic with their master, family and extended "pack" members. We will explain the evaluation processes of pedigree and genetics as well as aptitude testing for character and temperament when considering a future with one of our Pups/Dogs. All our puppies are Vet checked for excellent health and soundness before leaving the farm. They will have received 2 series of puppy immunizations and 2 wormings as well as their Volhard puppy evaluation. At Sycamore Spring Farm we produce and deliver exceptional puppies...full of HUGE possibilities. The new FOREVER Owner/Master, MUST be willing to invest in; the one-on-one time, proper training, health care and DEVOTION to develop the full potential of these AMAZING dogs.